When you’re traveling, whether it’s international or to a distant family member’s home over the holidays, you never know what you’re going to find food-wise. Sometimes it will be great but other times… let’s just say that the food might be less than perfect, with problems like to little seasoning, too much seasoning or really strange seasoning. A few spices of your own can go a long way in making any eating experience a good one and the Foodie Survival Kit is designed to help. 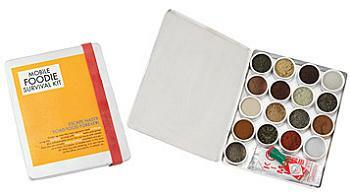 The kit comes with 17 organic herbs and spices, as well as small packets of hot sauce and soy sauce. The spices include dill, mustard, clove, garlic, nutmeg, paprika, wasabi, basil, onion, ginger, thyme, cinnamon, curry, oregano, cayenne, salt and pepper. All are packed in individual tins inside of the 4″ x 6″ carrying case – that’s small enough to fit into a purse or glove compartment! Now, I don’t really recommend offending Aunt Ida by breaking this out at the dinner table, but if you happen to have a pinch of salt and garlic within easy (and subtle) reach, I say go for it. Another time this will come in handy is if you’re cooking at a friend’s home where they don’t stock the same spices that you do, and you’re trying to season a favorite dish. When you run out of the spices that come with the kit, replace them with your own favorites, or more of the original spices. I can honestly say that salt, pepper, soy sauce and hot sauce would be my must-haves in the kit. I would add some ketchup, too, if it would fit in the box. What would you put in yours? I would probably add herbes de Provence as well as fennel and mint leaves! I’ve just added it to my Amazon wish list for Christmas. So cool! I love the idea of a spice survival kit! When we travel we often rent an apartment to stay in, and I always carry my favorite spices with me. And a knife, but that’s another story. This would be perfect to replace my spice kit! Thanks for posting this. I’m involved with Navy shipbuilding programs, and occasionally I have to ride on the ship 3-5 days a ta time to observe testing. The food options are limited and awful, and you can’t really bring your own food because there’s no place to store and prepare it. This would be a nice way to make those flavorless, overcooked, canned vegetables that they serve on the ship more palatable! What a great idea! So perfect for when you’re going to be cooking on the road. Ooooh this would have come in so handy for me this weekend at my boyfriend’s house! We had spiked some eggnog with rum and I just needed a pinch of nutmeg on top! It sure is amazing how many things we take for granted and then when we go abroad we can’t find it. I noticed that with cheddar cheese. Of course, I don’t think I’d want to pack that in my suitcase in case my luggage got lost for a number of weeks! LOL. I can see how this would be great while traveling abroad. I would just be very worried about packing it in my suitcase and having it leak everywhere. Can you imagine getting to your destination only to find your suitcase leaking soy sauce? No thanks!